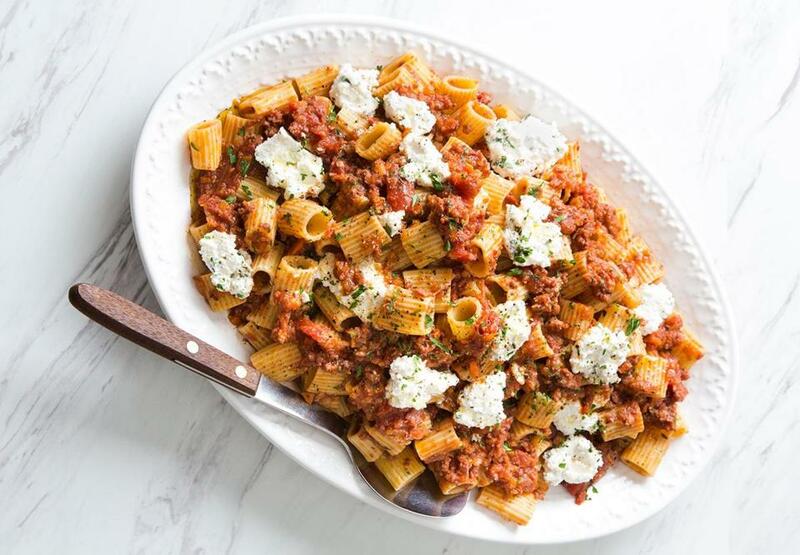 Sicilian shepherd’s pasta and simple pork ragu with rosemary are hearty sauces for the cold months. Let’s talk tomato sauce. If summer is the time for quick, light, raw sauces, then deepest, darkest winter is the moment for the polar (lame pun intended) opposite: rich, slow-cooked, meaty sauces, often referred to as ragu. Of course there are countless variations, depending on the meat and flavorings used, on national and regional traditions, and, naturally, on cooks’ tastes. Here are two examples that are satisfying, straightforward, and more complex than a quick sauce with ground meat, but less elaborate and time-consuming than the familiar Italian-American Sunday gravy. Pasta is the natural partner for tomato sauce, but I also enjoy these sauces over polenta or warm white beans, or on a baked sweet potato. Salami and pancetta boost the flavor of this rich, ricotta-laced dish, adapted from The Italian Country Table by Lynne Rossetto Kasper. 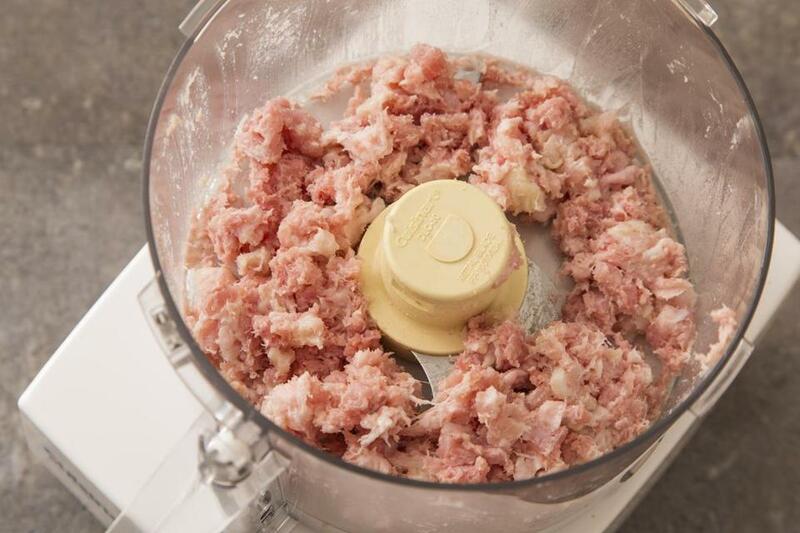 In a food processor, pulse the pancetta until finely chopped and almost pasty. Add the salami, onion, carrot, celery, and 1 tablespoon of sage and pulse until the mixture is finely chopped and almost pasty. In a large saucepan or Dutch oven over medium heat, heat 1½ tablespoons of the olive oil until shimmering. Add the meat-and-vegetable mixture and ½ teaspoon salt and cook, stirring occasionally, until moisture has evaporated, about 10 minutes. Spread the mixture evenly in the bottom of the pot and continue cooking, stirring occasionally, until a thick fond has formed on the bottom of the pot, about 8 minutes longer. Add the garlic and red pepper flakes and continue to cook, stirring, about 40 seconds longer. Add the wine, adjust the heat to medium-high, bring to a strong simmer, and cook, scraping the bottom of the pot to loosen and dissolve the fond, until the liquid is almost completely evaporated and the mixture is pasty, 2 to 3 minutes longer. Add the tomatoes, bring to a strong simmer, adjust the heat to medium, and cook, stirring occasionally, until thickened, about 15 minutes longer, adding the remaining sage and black pepper to taste in the last 5 minutes. Add about ‚ cup of the parsley and stir to mix. Adjust the seasoning with salt and black pepper if necessary, and reserve about ¾ cup of the sauce. Add the cooked pasta to the pot with the sauce and toss to combine well; cook, stirring constantly, until the pasta is fully al dente and well married with the sauce, about 1½ minutes, adding enough cooking water to loosen the sauce and help it distribute evenly. Adjust the seasoning with salt and black pepper if necessary. Meanwhile, in a medium bowl, beat the ricotta, remaining 1½ tablespoons olive oil, ½ teaspoon salt, black pepper to taste, and about 1½ tablespoons of parsley to blend. Scrape about a third of the pasta mixture into a warm serving dish, spread into an even layer, and dot with a third of the ricotta mixture. Repeat with another third of the pasta and ricotta mixtures. Add the last third of the pasta mixture, top with the reserved sauce, and dot with the remaining ricotta. Sprinkle with the remaining parsley and serve at once. In the Sicilian Shepherd’s Pasta recipe, it’s necessary to grind the pancetta in the food processor before adding other ingredients. This will help break down the nuggets of fat sufficiently and allow the mixture to mimic the texture of ground meat. To serve with pasta (choose large rigatoni, tagliatelle, or pappardelle), cook it shy of al dente, drain, and stir it with the sauce over low heat until it’s fully al dente and well married with the sauce, adding pasta cooking water as necessary. With the rack in the lower-middle position, heat the oven to 325 degrees. In a large, heavy Dutch oven over medium-high heat, heat the olive oil until shimmering. Lightly salt and pepper the ribs and add to the pot so that pieces are close together but not touching, and cook, undisturbed, until deeply browned on the bottom, about 3½ minutes. Turn the pieces and continue to cook, undisturbed, 3½ minutes longer. Transfer the meat to a medium bowl, leaving as much fat as possible in the pot. Meanwhile, in a food processor, pulse the onion, carrot, and celery until the mixture is finely chopped and almost pasty. Scrape the mixture into the pot, add ¼ teaspoon salt, adjust heat to medium, and cook, stirring occasionally, until moisture has evaporated and a fond has formed on the bottom of the pot, about 5 minutes. Add the garlic and rosemary and continue to cook about 1 minute longer. Add ¾ cup water, adjust the heat to medium-high, bring to a strong simmer, and cook, scraping the bottom to loosen and dissolve the fond, until the liquid is almost evaporated and the mixture is pasty, about 2 to 3 minutes longer. Add the tomatoes, sugar, and ½ teaspoon pepper and stir to mix. Add the browned pork with accumulated juices, submerge in the mixture, and bring to a strong simmer. Cover and bake until the pork is very tender, about 2 hours. With a wooden spoon, break up the pork into small pieces and stir to distribute. Add the Parmesan and parsley and stir to distribute. Adjust the seasoning with salt and pepper, if necessary, and serve. Adam Ried appears regularly on “America’s Test Kitchen.’’ Send comments to cooking@globe.com. Follow us on Twitter @BostonGlobeMag.